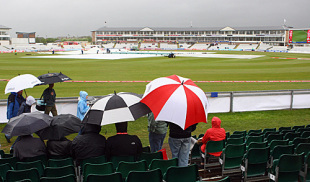 No play was possible on the second day between England and West Indies at Chester-le-Street, as persistent rain settled in over the ground to force an abandonment shortly after an inspection at 4pm. The wash-out meant that England were unable to build on their comfortable overnight position of 302 for 2, with Alastair Cook remaining unbeaten on 126 not out, 13 runs short of equalling his highest score in Test cricket. The miserable weather heightened the sense of gloom that has accompanied this match, after only 3000 of a possible 17,000 tickets were sold in advance of the first day's play - the lowest gate at a Test match in England in modern times. As a concession to the few fans who did turn up to watch the rain fall, Durham announced that all ticket-holders for the second day's play would be given free entry for any day of their choice for the remainder of the match. ""Obviously we are disappointed that the rain has prevented any play," said Durham's chief executive, David Harker. "We would like to offer the spectators that have missed out today the opportunity to come along on any of the remaining days as a gesture of goodwill. We hope that they can take advantage of the offer and help us support England for the rest of the match."